From January 25-31, 2016, the 2016 edition of National Drug & Alcohol Facts Week (NDAFW) will be held. Every year, this observance focuses on helping teens to get the facts and SHATTER THE MYTHS that surround the abuse of drugs. Since National Drug & Alcohol Facts WeekSM was founded in 2010, it’s grown to become an international event featuring scientists and addiction experts, where teens can talk openly about drugs without judgment or fear. This year, NDAFW is offering plenty of resources for parents who want to start a dialogue with their teens about drug use in their communities. Learn these 10 must-know myths about teenage drug use and get the facts to help you and your teens SHATTER THE MYTHS together! Myth: You won’t die from taking meth. Fact: Methamphetamine use can kill you. Health risks associated with meth include stroke, elevated body temperature, and heart attack. Myth: You can’t get addicted to marijuana. Fact: Marijuana is an addictive substance. In fact, NIDA reports that teens who begin using marijuana before the age of 18 are four to seven times more likely to develop an addiction to it later in life. Myth: Chewing tobacco is safer than smoking cigarettes. Fact: The body absorbs nicotine much faster through chewing tobacco than through cigarettes. Myth: Drinking cough syrup for recreation isn’t really dangerous. Fact: Abuse of cough and cold syrup can be fatal, particularly when these medicines are mixed with alcohol. Myth: Street heroin is “pure”. Fact: Heroin purchased on the street usually contains several substances, including some that are toxic. Myth: Taking ecstasy will make you feel happier. Fact: While some ecstasy users have reported an increased feeling of love and empathy, others have experienced negative effects such as agitation, anxiety, and depression. Myth: E-cigarettes are safer than tobacco. Fact: The vapor of some e-cigarettes has been found to contain known carcinogens (substances that cause cancer). Myth: Teens are more likely to try “crack” than cocaine. Fact: According to NIDA, 12th graders are more than twice as likely to try cocaine than crack. Myth: Prescription drugs aren’t really “drugs”. Fact: Prescription drugs are dangerous substances, especially if they are taken for recreational purposes. Taking a prescription drug that does not belong to you is considered drug abuse. Myth: Taking anabolic steroids will make your body stronger. Fact: Use of anabolic steroids can cause your body to stop growing, especially if teens begin using it during puberty. Anabolic steroids have also caused severe acne, high blood pressure, and an increased risk of cancer in some teens. Talking about drug and alcohol facts with teens can be tricky. Some teens may withdraw whenever you try to broach the subject with them. Others may feel embarrassed or ashamed to talk honestly about their feelings on the drug issue. The National Institute on Drug Abuse has provided several resources that can help parents talk about this important subject with their teenagers. For example, the National Drug & Alcohol IQ Challenge is an awesome tool for testing both parents’ and kids’ knowledge about drug use. Personally, I found taking the IQ Challenge to be tremendously helpful in starting a dialogue with my child. Turns out we both have a lot to learn about the drugs that pose a danger in our community. The Family Checkup is another NIDA resource that can help us as parents to establish an open relationship with our teens, even when we have to talk about the pressure to try drugs. Be prepared, though. The questions and suggestions in the Family Checkup are pretty blunt and they can really make us reexamine our approach as parents. But that’s a great thing! We want to make sure we’re prepared to handle any situation, especially one that can threaten the safety of our kids. If you find that your teen has a problem with drugs, NIDA has resources that can help. There are warning signs, tips, and encouragement to help parents find treatment, make decisions, and provide help to their teens. How have you helped your teenager to get the facts about drug use? Please share your experiences in the comments! You make a good point about how seriously people should take recreational drug use when it comes to prescription drugs. These can definitely be problematic, as you suggest. This is a very big topic. Those myths, I was surprised that drugs are taken so lightly. That individuals feel they can’t die from them. But when I think back to when I was younger at the experimental stage of my life, I heard about all the good these drugs did. I was eager to try them all. As my experience grew the come down was horrible. Depressed for a full day even longer, paranoid, anxious. And meth was not even around at the time. I find it the scariest drug on the market. There is so much choice, peer group pressure, hormones, teenagers wanting their independence. Its a trying time. What I have heard in the past – the words of hindsight. Parents saw the signs but put it down to others things (when you have no experience with drugs and what a person becomes how are parents supposed to know until addiction is upon a child) – its a busy time as a teenager. Those lines of communication between child and parent are so important. Glad there are awareness weeks where information and drugs are discussed. Thank you for sorting out these facts, it’s crazy how many myths there are that many take at face value. It is important to have awareness about these kinds of issues. I am just now seeing all the e-cigarette warnings out and about. This is very important. My kids have seen this happen to a relative. 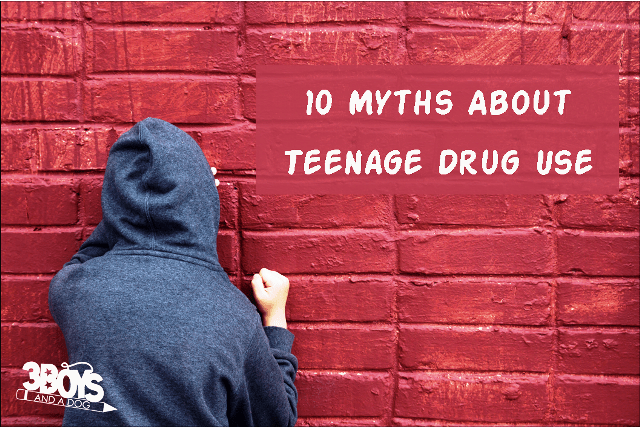 Wow – those are definitely some must-know myths about teenage drug use. Thank you so much for sharing these. We have covered all of this and more. thanks for all the great tips about myths about drugs. My kids know all of this and we are pretty on top of this topic. Great article to bring awareness regarding drugs and teens. They are most delicate and susceptible during this ages/stage. It’s important to be well informed on this issues. Oh, this topic is scary! My son is 10 years old, and this discussion is coming up. Great points you made! I am lucky to have a very open relationship with my teenagers. They know they can talk to me about everything. We have had many talks about drugs and alcohol. These are all great conversation starters to be honest. When I was younger my parents were very open with things in life. We talked about everything. I really think that helped me a lot. Great post! My son is doing the DARE program right now and is learning so much from it. It is so important that our kids know the truth about drugs. Thankfully I can draw from a lot of friends and family that have went through terrible experiences and teach my daughter from them. I hope to turn their bad experiences into good lessons. This is the kind of things that scares me for my kids. I hope that they don’t have to explore these things. Drugs are such a complicated and covert problem. As a parent, it’s hard to know how to approach the talk and to keep open communication with teens about it. I work hard to have a good back and forth with my kids now so that hopefully as they get older and are exposed to more and more we will be able to keep talking. These are very good for parents and teens to know! My husband is a narcotics officer so I know the what’s out there and it’s very scary. Thank you so much for posting this! It is so important for everyone, not just teens, to know these facts. It is painful to see every day another individual taken by drugs or alcohol, however the “it can’t happen to me” mentality of many youth makes teaching the lesson above so difficult. Our family had to go through someone in our lives who was a drug addict. It was a difficult thing and I try to make sure that my son knows about what drugs are so that he never falls down that hole. Wow. Even I didn’t know that marijuana can actually be addictive, and I’ve been around the block a few times. Right! I learned a ton while putting this post together as well! I worry about this because my oldest is almost a teen. I would like to think he’s smart enough to know better, but teens don’t think.